Each of Conestoga's priority research areas support applied research projects that meet the needs of our industry and community partners as well as drive growth in our local and regional economy. Advanced Recycling Technologies for Waste Electrical and Electronic Equipment (WEEE) Lab. Ideas Connect: Advancing Healthy Communities. At Conestoga, research projects are also integrated into the curriculum. Capstone, final-year, thesis, curriculum and independent projects are an important avenue of applied research. Through these projects, one or more students — up to an entire class — explore solutions to a challenge facing a company or community organization. Collaborating with Conestoga gives industry and community partners access to faculty expertise, student employees, and the college's innovative lab spaces and equipment. Partner with Conestoga today to tap into the college's tremendous research expertise, facilities and equipment. Faculty engagement in applied research at Conestoga can be a rewarding experience. translate project learnings into curriculum updates and enhancements. 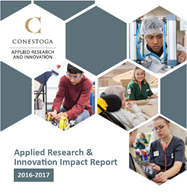 Students are a major part of the success of applied research and innovation at Conestoga. Conestoga Applied Research and Innovation (CARI) is the college's central resource for applied research administration. Contact CARI to explore applied research opportunities at Conestoga. To Access Conestoga's applied research policies and research ethics documents, visit policies & procedures: applied research.